One of my most favorite memories from my childhood is sitting in the living room listening to my dad read out loud. 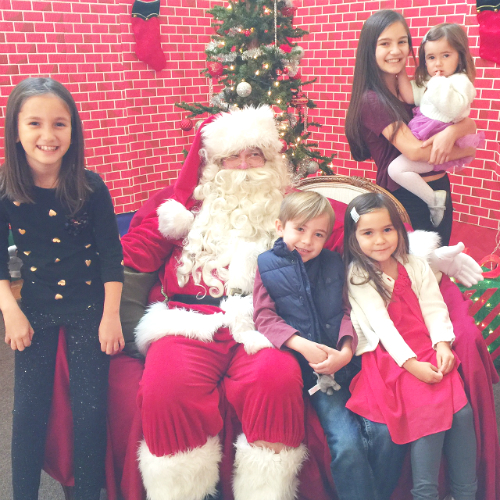 I loved listening to fun, happy stories around Christmastime, and my kids do too. 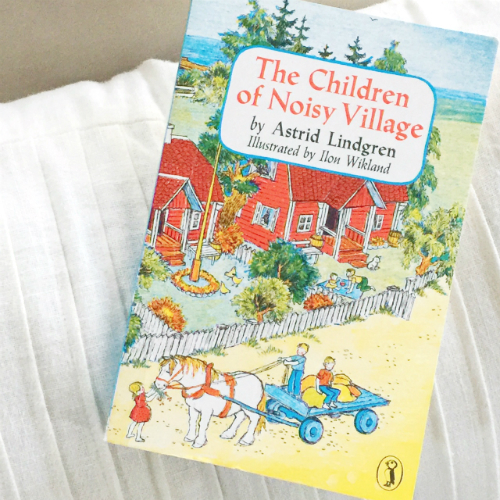 This year, I found a new favorite read-aloud book that is perfect for kids of all ages: The Children of Noisy Village by Astrid Lindgren. What a sweet and funny book! Each chapter is about the holiday customs of six Swedish children living in the countryside. For years, Andy and I have been reading The Best Christmas Pageant Ever to our kids every Christmas. We just love that book! It is still one of our favorites. But now my kids are asking me to read The Children of Noisy Village! When I was little, my sisters would start the 1000-piece Santa Clause puzzle every December. I wasn’t allowed to touch the puzzle until I was old enough to not break it! 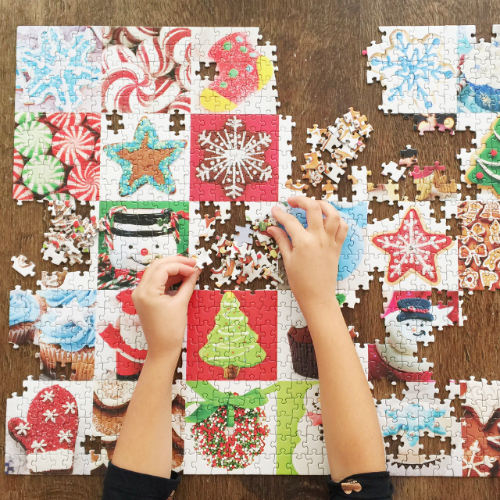 So just imagine how excited I was to finally get to work on the Santa Claus puzzle. 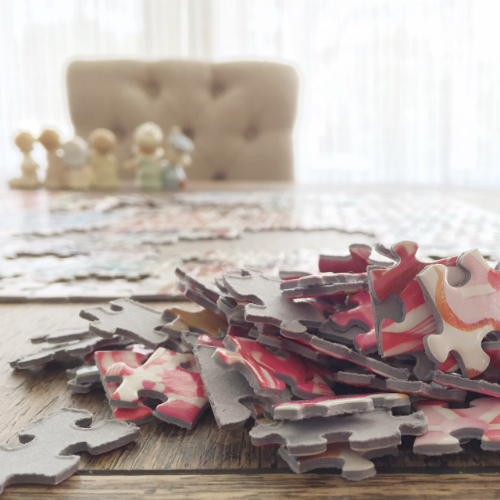 A few years ago, I went looking for a similar puzzle to start with my own kids. I thought this puzzle looked fun and delicious. This year, we found out that we have one piece missing. We finished the puzzle early this year, so I think I will put it away and bring out more puzzles to keep our hands busy on rainy days. 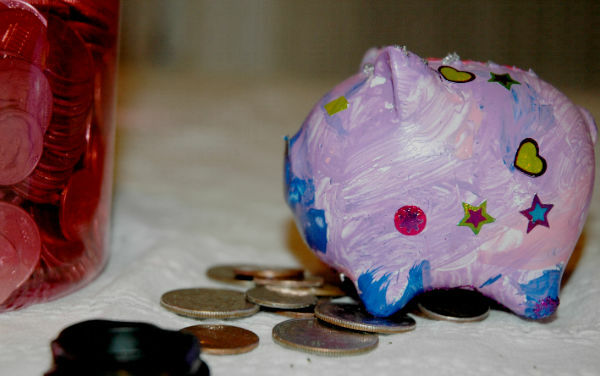 Andy’s mom gave the kids a jar that counts change and told them to save up their change all year so they could give a donation to charity the following Christmas. 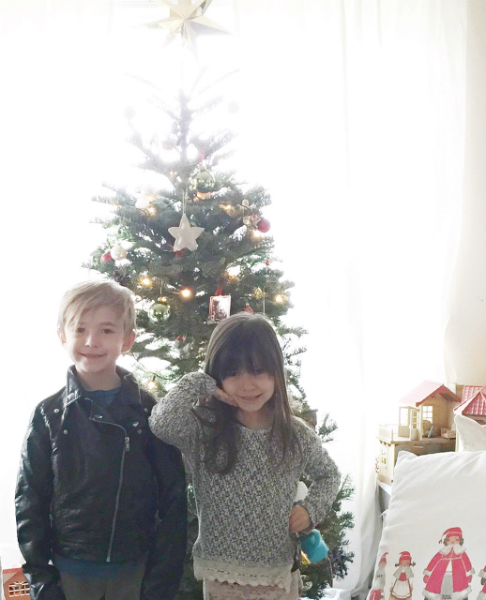 This became a fun and meaningful Christmas tradition for the kids. The first few years we gave our donation to Smile Train and World Vision. This year we will give it to a friend in need. 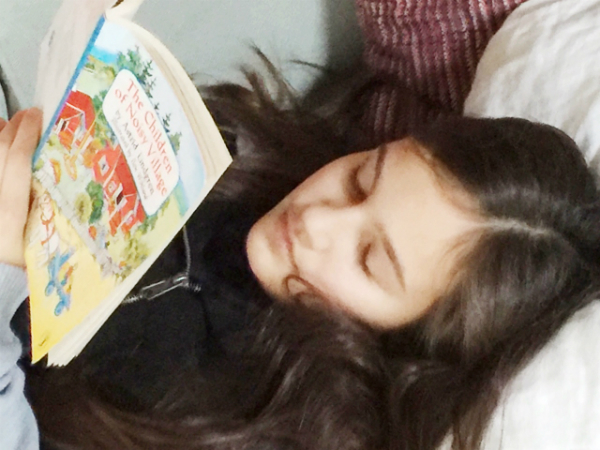 The best part about writing a letter to each child this time of year is that it helps me remember their stage of life, the funny things they say and do, and how they interact with each other–the little things that photos and videos cannot capture. I keep the letters in a special book that holds our family photos and/or Christmas cards as well. It might mean more to me than it does to them, but as they get older they appreciate the memories more and more. Our lovely neighbor made crafts with her grandchildren every year and gave them to their parents for Christmas. Soon after we moved in, she decided she would adopt our kids as her grandchildren and carry on the same tradition to surprise Andy and me with the projects our kids completed at her house. 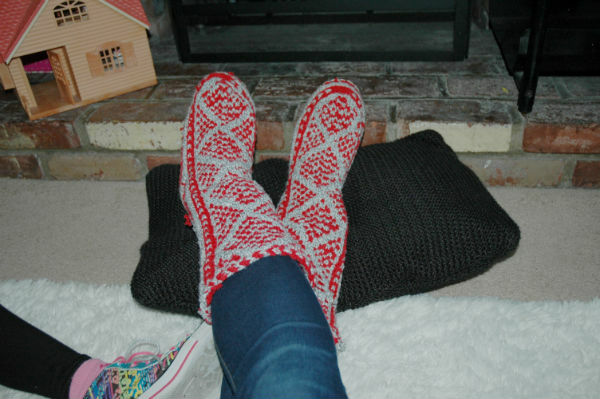 The crafts are really nice, sometimes quite complicated projects that take a few months. I can’t wait to see what they have been working on this year! 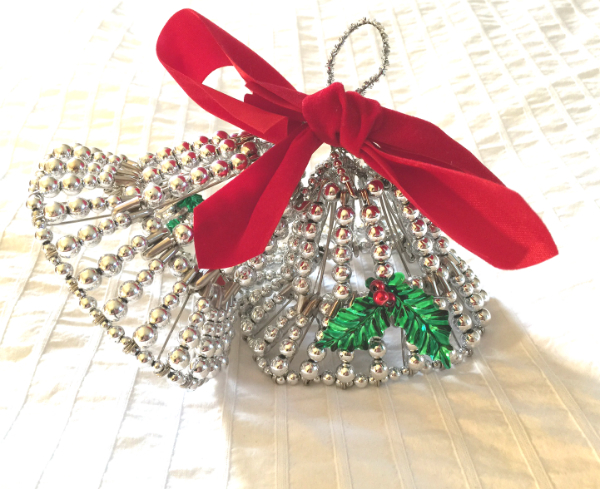 Angelina made this beaded bell decoration last Christmas. After I saw a magazine article picturing a tree with all handmade, natural ornaments: orange slices that had been dried in the oven, cinnamon stick stars, simple decorative paper that was hole-punched and strung, and simple cutouts of white, baked dough, I decided that I wanted to decorate my tree that way. I love how the natural items look on real tree branches! I added a few more things over the years: baked cinnamon dough cutouts, rosemary wreaths, white and red bean patterns glued to cardboard shapes, and white yarn pom-poms. It is fun for me to come up with a new, handmade, natural item to add to the tree each year. Of course, the kids make all kinds of handmade ornaments at preschool and church, and we hang those on the tree, along with candy canes and framed photo ornaments of the kids. Because Andy’s birthday is in December, and his favorite cookies are the Italian Cocoa Cookies his great great grandmother used to make, these cookies have become a Christmas tradition in our family. 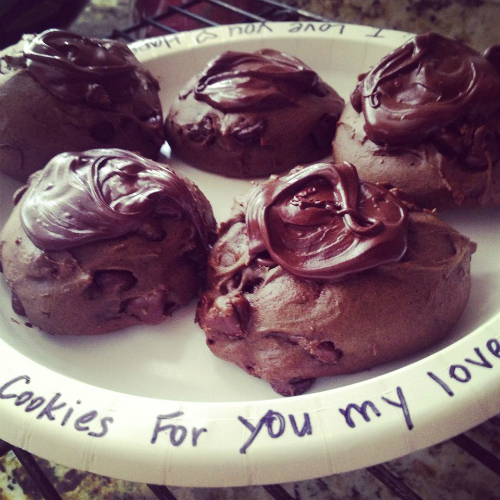 They are made with flour, butter, milk, sugar, cocoa, cinnamon, and spices, and topped with chocolate icing. 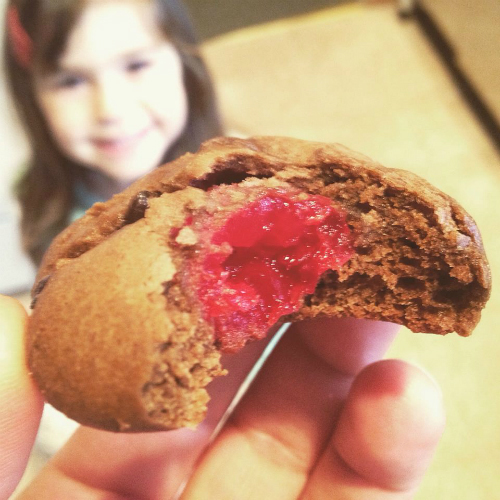 He prefers it when I bake them with a maraschino cherry in the middle–like his grandmother did! 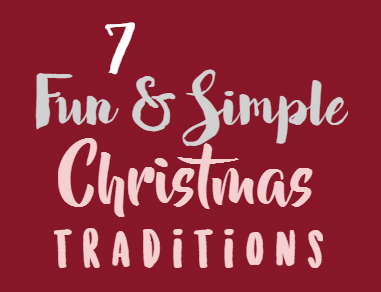 For many of us, Christmas just wouldn’t be Christmas without our special family traditions. What is one of your family traditions that you want to pass along? Please share! Chelsea Rotunno is the author of Goodnight to My Thoughts of You, a novel about life as a Christian teen searching for true love.